Like usual, I was reading The Monogrammed Life (Marley Lilly's blog that I write for) when I came upon the cutest darn bows I have ever seen. Seriously people, can it get any better than monogrammed bows? Bows are the perfect addition to any hair style. Having a bad hair day? Adorn one on the back of your ponytail! Or pin one on the back of your head with your hair down to instantly look chic. They are also great for when you don't want to get too dressed up-- bows add a special pizzazz to any boring outfit! 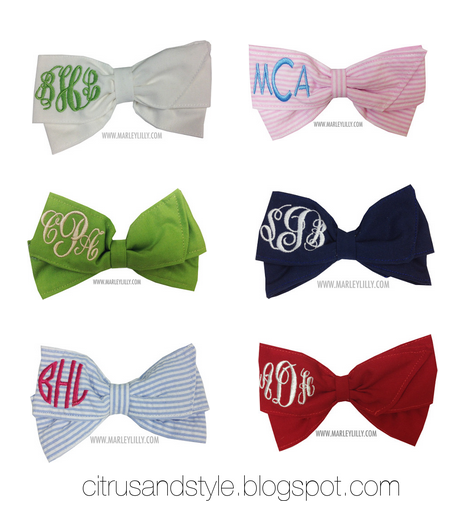 My favorite is definitely the light blue seersucker bow in the bottom left ;) You can bet I would get the hot pink monogram! Which bow is your favorite? Do you have a Marley Lilly bow? Love these!! Obsessed with the seersucker ones.